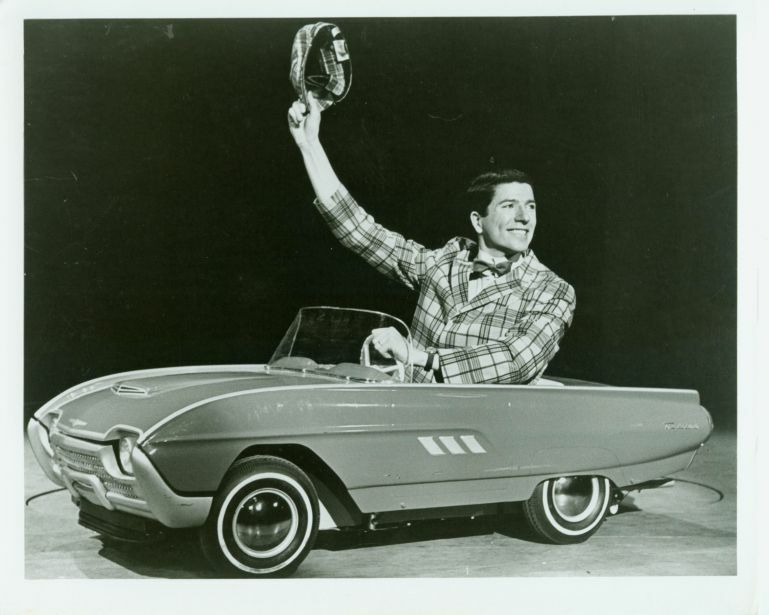 The Powercar company of Mystic Connecticut started making the Thunderbird JR in 1955 and continued through 1967 but stopped updating the body changes in 1966. According to the interview done with George Ford in 1990 they were electric powered until 1964 when you could also get a gas powered adult version. 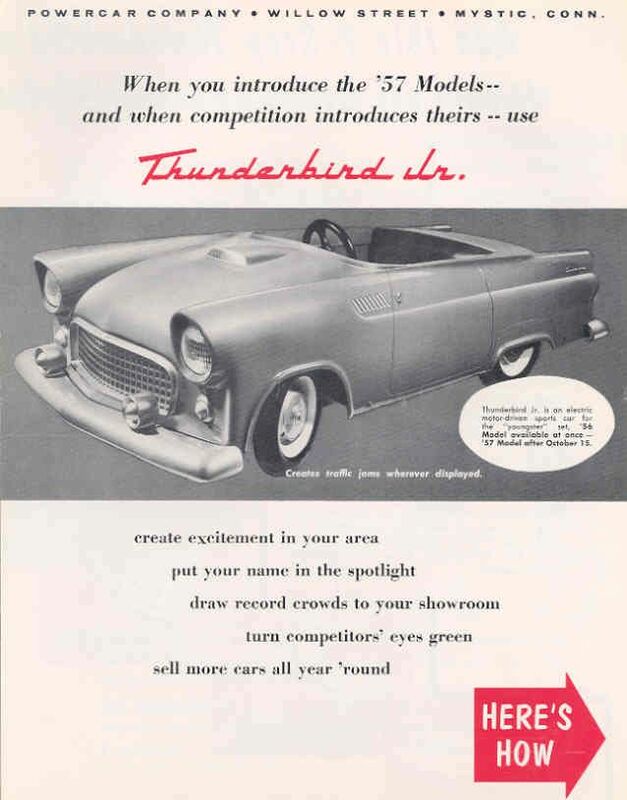 I have found factory literature and a Photograph of a gas powered 1957 Thunderbird JR. so George may have been a little off when he made that statement 23 years after the company went out of business. 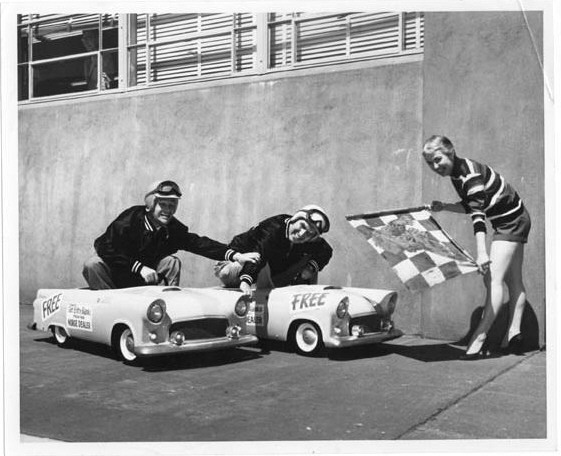 According to George ford (no relation to Henry) that ran the company they made about 5,000 mini Thunderbirds from 1955-67 starting with serial number one in 1955 and continuing through the end in 1967. The serial numbers were in the 3,000 range by 1957 so most of the production was done in the first 3 years. There were three models available in 1964-66. The bottom of the line was the electric powered kid's version. Next were the electric powered adult versions, and the top of the line adult gas powered version. All of them used the same body but the adult versions had larger axles and Pneumatic tires. Later versions in 1965-67 the cars came in standard colors and any other colors were at an additional charge. In the early years they could be ordered in a number of factory colors at no additional charge. Here are some of the costs that I know of. 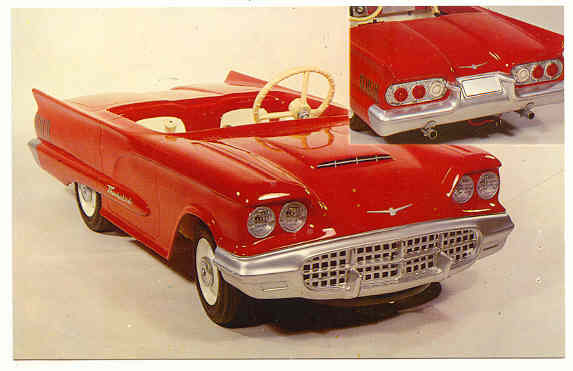 while the most known size of Powercar Thunderbird was a 1/3 scale rendition they also made a 1/4 scale in some years. 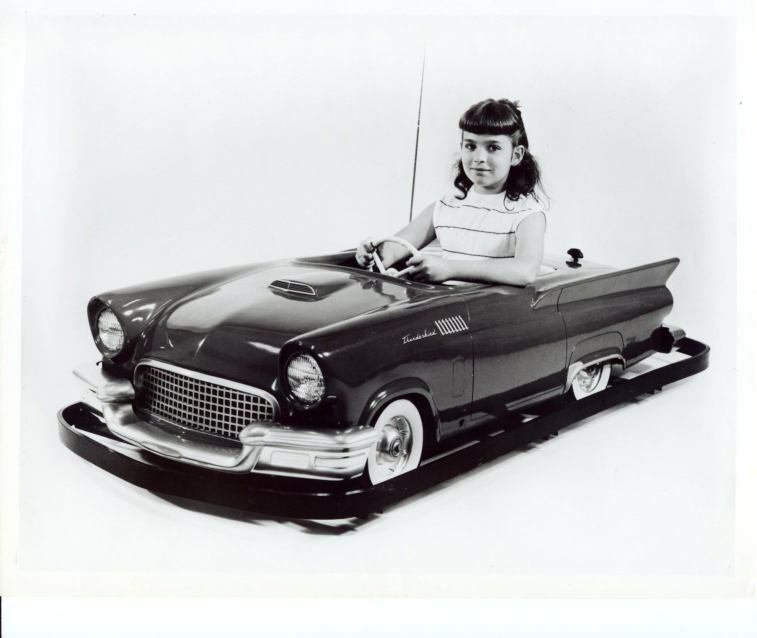 I have seen pictures of a 1956 version that was a pedal car instead of battery powered. 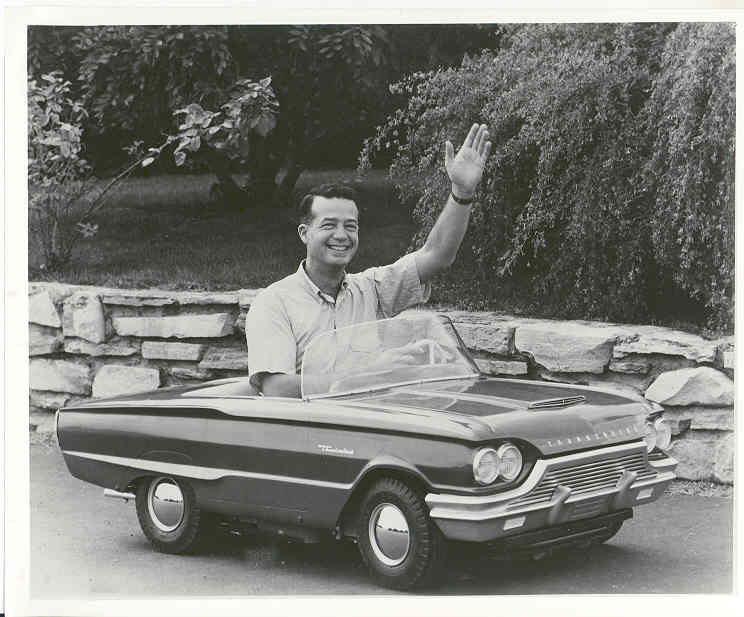 I have also found information and images on 1958-60 1/4 scale cars that were made as a less expensive offering by the company. 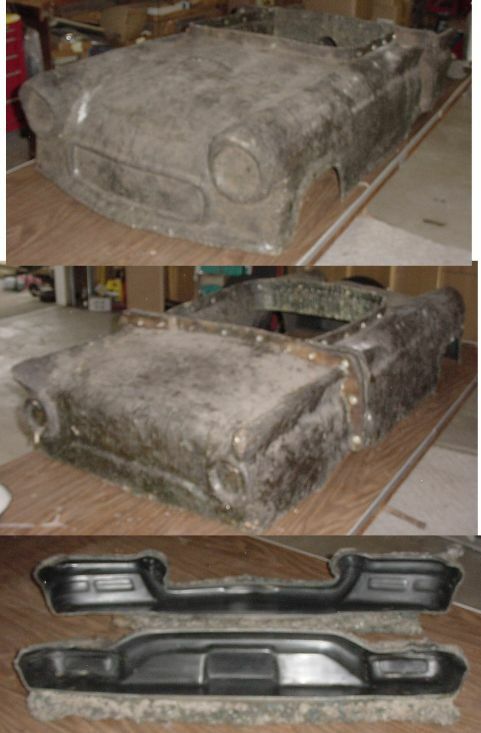 A 1960 Plymouth Fury JR was also made in 1/4 scale but it is the only other example of that scale that I have been able to find anything on thus far. The demensions for the 1960 1/4 scale were as follows I would imagine the 58-59 were the same size 51 1/2" long, 17" tall, 24 3/4" wide, and weight without battery was 80 pounds. I would imagine that one of their best customers would have been the Shriners but most of the information I have been finding is they were used in a lot of other promotions. They were given away in drawings at Ford dealerships Coca-Cola, Pepsi and tide and even at Laundromats and dairies. 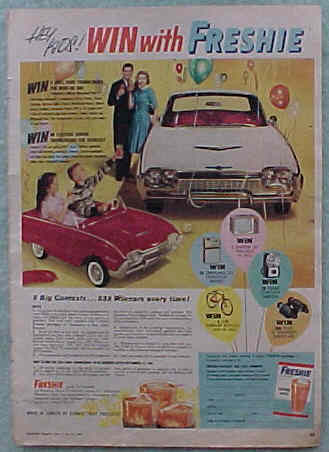 In 1960 Turkish taffy offered the winner of their jingle contest choice of a 1960 Thunderbird or Plymouth Fury JR. They advertised the competition in "Atomic Mouse" cartoons. 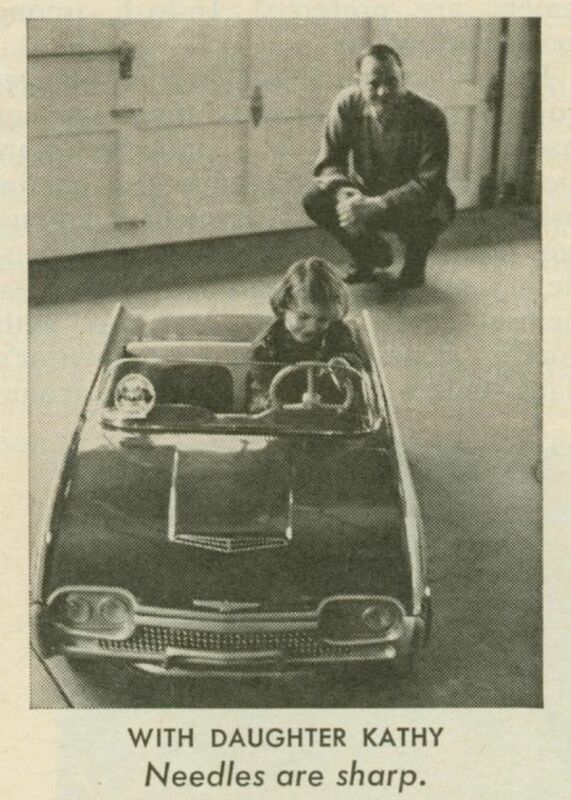 Lee Iacocca's daughter is pictured in a 1963 Thunderbird JR in a 1964 issue of time magazine. They were also available through the F.A.O. Swartz catalog. The statement they used on the brochures says it best! "Thunderbird Jr. cars have been made continuously since 1954 (with the cooperation of the ford motor company) you will not see a Thunderbird Jr. in every yard...because their cost has kept them out of the volume market...However, if you know where to look, you can find them scattered over the globe in the most interesting places: in secluded country estates, in mansions of heads of state, on the Riviera, in the palaces of dictators, middle eastern and oriental princes. They are bringing pleasure and fun to the families of presidents, movie stars, magnates, potentates... and to a lot of ordinary people too, who have won them in promotional contests or as incentives. In fact, it is thanks to smart sales promotion programs that many other people are enjoying them"
Since I started collecting information on these cars many years ago I have been lucky to talk to a number of Ex-employees of the Powercar company. Anywhere from the son of the secretary that swept up on weekends to the Production manager and his son who worked as a test driver in the early years. I also had the pleasure to talk to George Ford that ran the company back in 1994 before he passed away. More and more information continues to come out of the woodwork about these cars and the Internet has helped to gather additional information. 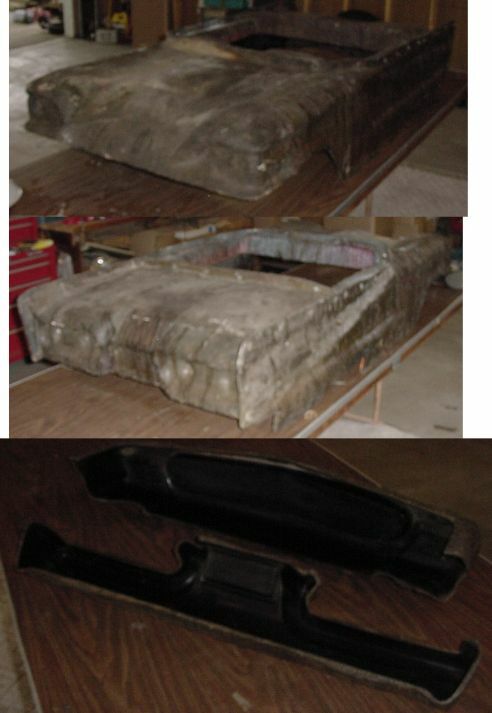 I have started a Resources page that will list known available original parts and reproduction parts for Powercar products. As with most manufacturers of the time cars saw a three year rotation. with the end of the "baby birds" 1955-57 First of the big birds or "Square Birds" were introduced! just like the full size cars the Juniors saw a noticeable increase in size. 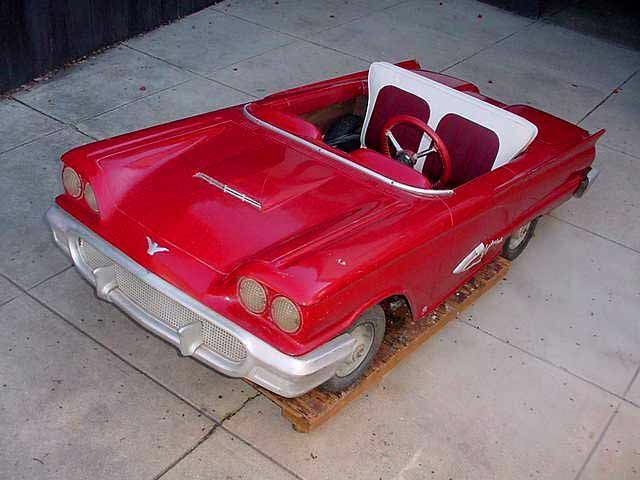 The 55-57 Thunderbirds would carry one child with relative ease. and some adults would cram themselves inside or sit on the trunk to drive them. 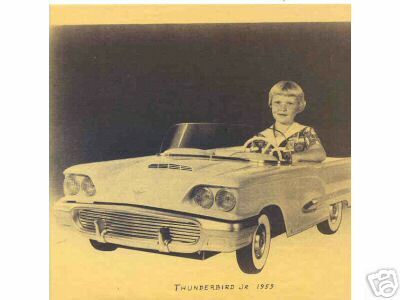 In 1958 the thunderbird Jr would fit two kids or one normal size adult. 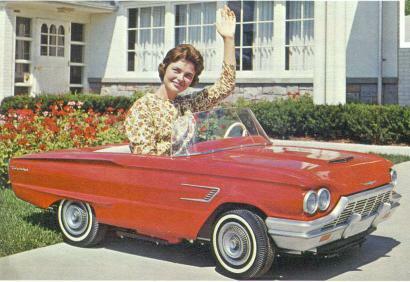 With the pedals out by the grille it was possible for an adult to easily drive a Junior from the normal position not on the trunk. obviously these cars were intended for long driveways and sidewalks. 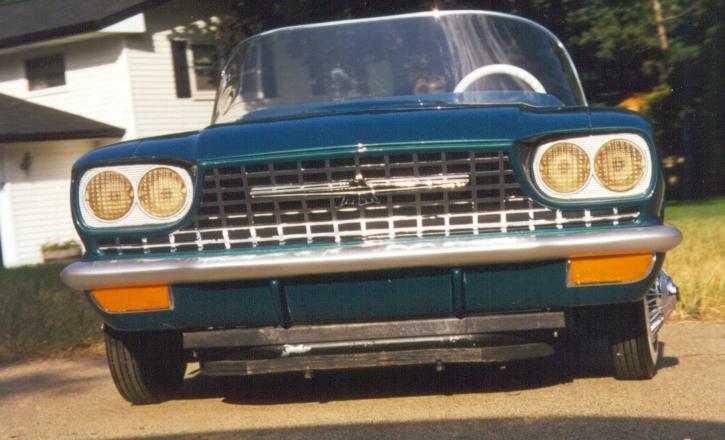 In 1959 the same body was used as 1958 but the grille insert changed the taillight panels of the 58 egg-crate pattern was covered by a vacuum formed panel with ribs that matched the grille insert. Side trim was also changed to replicate the full size cars. Again minimal changes from the previous years production just like the full size cars. the side trim would have been the primary difference. "Flair birds"
see the front of the 65 full line brochure here! see the rear of the 65 full line brochure here! 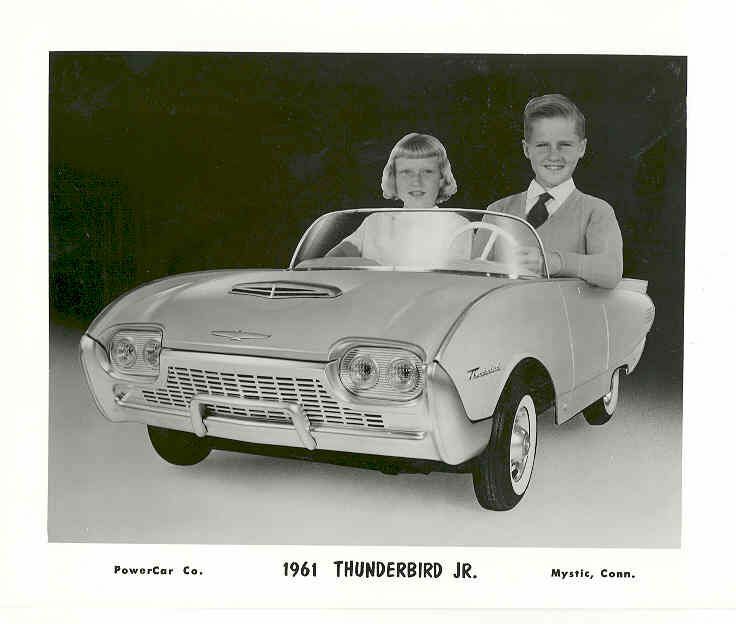 The last of the Thunderbird body styles, even though the company produced Thunderbird JRs in 1967 they did not update the body that year. 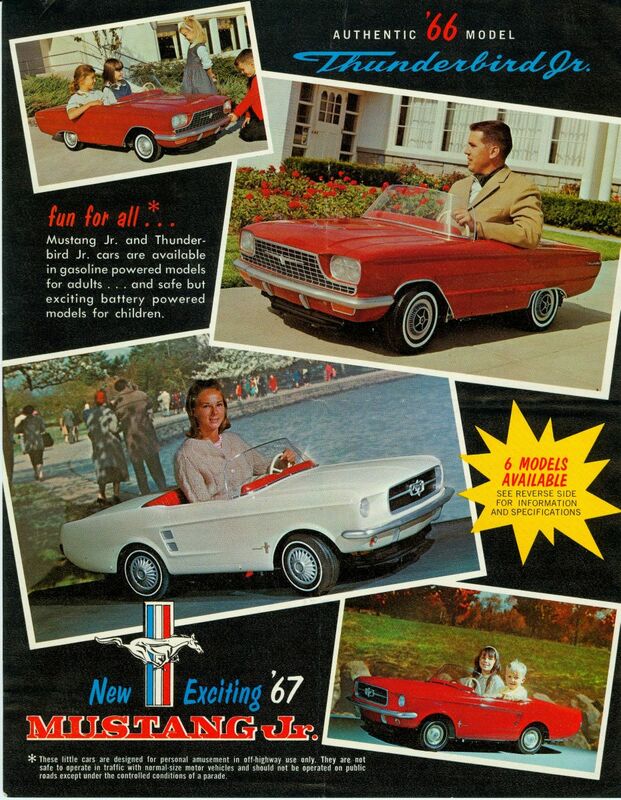 The 1967 company sales brochure. has an updated 67 Mustang body but they 66 T-Bird body remains the same even though the full size car saw some major changes that year. "Flair birds"
see the front of the 66 full line brochure here! see the rear of the 66 full line brochure here!